Key Issues: I Can't Breathe! Home needed. I will attempt to make a long story less long. 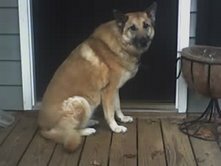 Our first german shepherd - that we bought from a neighbor, as a pup, upon Miss Priss's begging, when she was a cute three year old with spiraled curls - was stolen from my yard over four years ago. The dog was wearing a collar with his name, my number, and rabies tag with our vet's number. He was definitely stolen. And yet... Priss would not sleep until we had checked every shelter in North Georgia. And we did. The last of the shelters we checked was in Barrow county, which holds animals ONLY 5 days before euthanizing. I walked in and, of course, did not see my dog. The guy explained to me that Shepherd rescue sweeps up most of the purebreds anyway. I looked at her big, brown eyes and asked the guy at the shelter how long she had. "She's been her nearly a week ma'am. She's to be put down in the morning." Well, that was it. It wasn't the plan, but she was going home with us. She is the sweetest animal, and soon became a favorite of the family and extended family, but before too long I discovered that I am quite allergic to her. Determined that my sinuses were bad anyway, - and they were - I decided to postpone a decision on whether or not to keep Kira until I had had my sinus surgery, which would happen later that year. It helped actually. But my allergy has grown over the years, and last time I went to the allergist, the "dog" spot on my arm looked more like a mosquito bite within seconds. Stubborn me, I still didn't want to give her up. But... Now, on top of my not being able to breathe with this furbaby in the house, it seems that Miss Priss is developing similar allergies. Combine that with the prolonged out of state travel, and I realize it is time to find her a home that is more suited for her. I don't even have a fence. Kira has become too human-like. She prefers to eat what we eat, wants to sleep in the same room we do, and she has become a regular couch potato. Why here instead of the paper? I am advertising here because I have never known such loving, tender-hearted people as bloggers, and I want Kira to go to someone who will pamper her, who will bring her in on hot days, cold days, stormy days, and every night. And who will lavish her with more attention than I've been able to give her thanks to my watery eyes and incessant sneezing. The facts: She is timid, especially with men, as she was likely abused before I came to own her. She is also the most mild-mannered dog I have ever known. Her best friend is a feline, and she has frequent play-dates with another dog. And thanks to the foster kids, she has been tried and true around little ones. She loved and protected the attentions of the 18 month old, the hyper 3 year old, and on up to Miss Priss's current age of 10. Ironically though, I am her favorite. She does not have accidents, and can hold it inside for as long as 10 hours. She is recent on shots, and she has muscle relaxers, but only needs them for storms, and NO! I have never dipped into her stash. (Seriously.) She has NEVER bitten or nipped at all. (She is even gentle when she accepts a treat.) She does not bark or growl, EVER, unless someone is lurking around outside. And yes, she is the scare tactic I used to get the lascivious bug man out of my house a few months ago. She will be sorely missed. But this is something that has to happen. And so, if it must let her go, I am begging my blog-buds for help getting it done. For the right home, I am willing to drive the mileage to get her settled in. UPDATE: Priss and I made a Father's Day road trip. ... Up to North Georgia to check out this Vicki person whom I met in my comments. She graciously offered to take Kira on a temp-to-perm basis, depending on their mutual agreement. It turns out that Vicki is this wonderful, dog-pampering sort, who has doggie treats that I wouldn't mind eating, plus she has canine friends for Kira whose eccentricities do not seem to clash terribly with those of my nervous pup. Amazing. As Priss and I left, Kira seemed quite content, and I felt more than comfortable leaving her with a faithful reader of GOC, and occasional reader of yours truly, the former, of course, being the better endorsement. I wish I could help Key. I can't though. I've got two already, and since the lady acrossed the street passed, I've been tryin' to find a home for her shepard... I wish you and Kira the best of luck. If I lived there, I would in a heartbeat!! I'll look around to see if I know anyone in your neck of the woods that is looking. Key, good luck with the search. We had a husky-shepherd mix that we had to give up when our little one was born with serious health issues. It's hard to give them up; I hope you find someone that you trust to take Kira. ..did you find a home for her? You are in TN? I'm in Georgia mountains, close to Ducktown, TN, and Murphy, N.C. I have two cats but I still want a dog. I just don't have the time or the space for a proper-sized dog to run around. I hope that vicki or someone can take her! Find her a home Key. I know you will. I just lost my two goldens (to divorce) and want a companion desparately but I'm living in a no pet apartment and won't be able to move for a couple of months yet. She is a very confident lady...peaceful and content. Kira remains a Georgia Peach...she is living in North Georgia Mountains. Thank you Key and beautiful daughter for bringing her to me. Yes...and it goes to GOC..
Yeah V-Man. I want some Chatham Artillery Punch. In Helen. In September. Zonker's setting it up. She likes my two dogs and me...and we like her. Getting accepted by my two spoiled brats was a hurdle...but Kira did it. They even share with her. Kira's interests center around lounging and chicken treats! On July 3rd, Kira has an appointment at the groomer to get some of her heavy fur trimmed off and nails done...she's a keeper. I am so glad Kira found a home! I have two Akitas that were rescue animals and I can't tell you how wonderful they have made my life! A dog will love you forever! Your kids love you untill the allowance runs out.